Homeschool without stress? Yeah, right. With the kids, and the books, and the assignments, and the co-op... oh, and don't forget SOCIALIZATION! And then there's the housework and the bills and the groceries. And maybe a few minutes for your spouse. Is it possible to create a restful homeschooling environment for you and your children within our modern homeschooling culture? Well, I think it's possible. The word school, at its root (scholé), includes 'leisure for learning' as one of it's basic definitions. Leisurely learning sounds awfully nice to me. But can we do it? And what exactly does it look like? My guess is that it looks different in every homeschool. But I suspect that there are a few similarities between these restful learning environments. Let's take a few minutes and consider what restful learning entails. Like I said in a previous post (finding the scholé in your homeschool), it's all about you. As the mother of the home, you set the tone. It's up to you to create a restful learning environment. There will be work involved! We need to be intentionally involved if we want to create that restful learning atmosphere for our children. Why do you homeschool anyway? That's one big goal right there. But let's take it down further. What are your specific goals for each of your children this year? To finish that math book? Perhaps. If you have clear, actionable goals in place, then you can focus on those things that are important. Would that neat looking lapbook be lots of fun? Sure! But working on math facts or Latin conjugations or phonics lessons might need to be your focus. I'm not saying you need to skip the fun stuff. But when you are feeling stress and trying to get it all done, it's time to go back to the basics. And, when you have cut out the fluff, you have naturally created time for your child to explore those things that interest him most. Don't get distracted by all those shiny-new homeschooling programs. Use what works for you and your kids (even if it isn't flashy and cool). Create time for those natural learning moments. This is where the rubber meets the road, homeschool mom. Restful learning (and teaching from rest) starts with you. You need to be prepared for the day and for the week. Whether that means all your supplies are organized and papers printed before the school year begins or whether you organize each week, you have a plan in place. Another part of being prepared to teach is the programs and curriculum you use. You need to be the master of your curriculum. Don't become a box-checker. Curriculum is a resource. It shouldn't be running your homeschool. You need to take the time to study and prepare. It's work. Creating a restful learning environment takes effort. But when you are prepared to teach you will be more relaxed and restful. You'll be able to help your child if they are struggling to understand a concept because you'll be comfortable teaching. But getting to that place only comes with time and effort. Do I have it all together? Yeah, right! I'm working at creating a restful environment. And it is work. Hard work! I spend time doing the work and the studying so when it comes time for the teaching and the learning I am prepared. The work is hard. Some days I fail. Some days I feel successful. But it is still a journey of one step at a time. The reward is worth the effort. 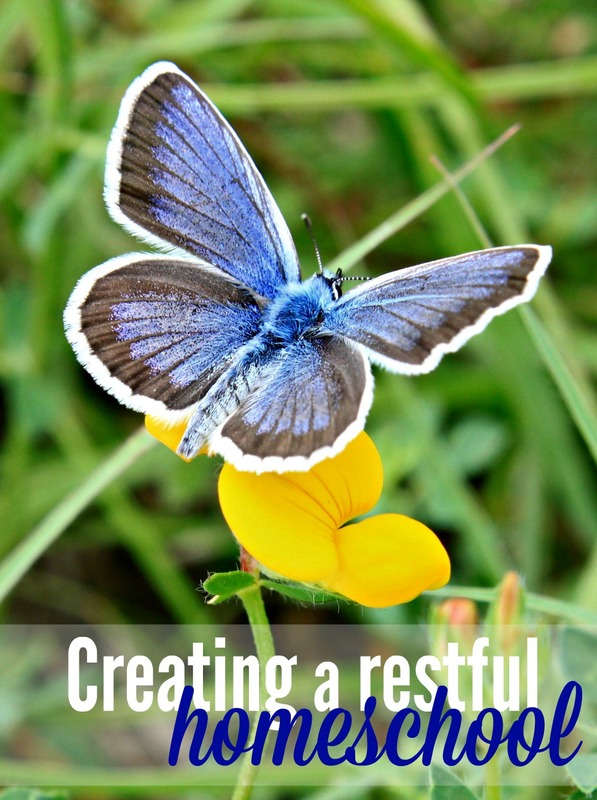 How are you creating a restful learning environment in your homeschool?